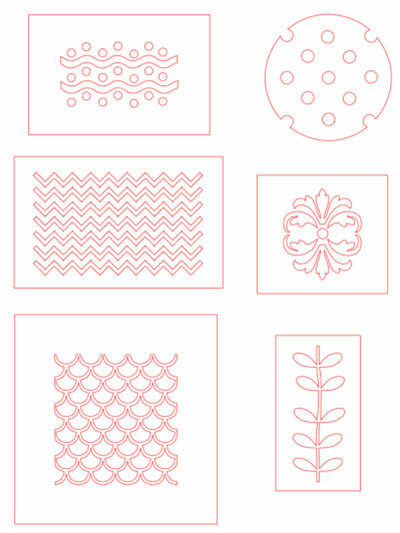 Little Stencils – Free File Friday. At the request of one of my new followers. 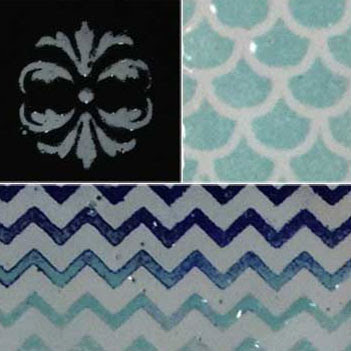 (Hi Nicky) – this week’s Free File is a set of small patterns that I made to use as Stencils when I did an enamelling class earlier in the year. This is the post I did at the time. The first three patterns below I designed from scratch and for the last three I used the Peoni Pattern Font as the starting point for the designs. I was stencilling enamel (powdered glass) onto small samples of copper and needed to lift off the stencil easily without disturbing the enamel powder, so I used Acetate, but if you are stencilling with paint you could cut the patterns from vinyl or contact paper instead. Of course you can also delete the patterns you don’t need and enlarge the one you wish to use. I also used a couple of the designs as coffee stencils. Just put the stencil over a cup of coffee and sift chocolate powder through to make a pattern in the milky froth. My husband was impressed with his chevron styled coffee! Don’t worry though, it was before I used the stencil for the enamel samples – I wasn’t trying to sneak glass powder into his food!! 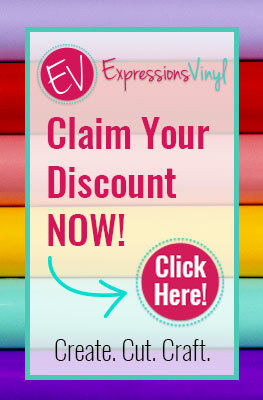 I hope you find these handy, if not as stencils – then as cut files …..
You have been a busy beaver, Pam, to create this selection of stencils. I am sure they will prove popular. Hope you are having a good week.